Here’s a fun way to review prepositional phrases and spread holiday spirit! The Gingerbread Pirates by Krisitin Kladstrup is a nostalgic story with an adventurous spin for anyone who has baked holiday cookies and set them out on Christmas Eve for Santa. The adventure comes when the gingerbread cookies in the shape of pirates come to life! And yes, this book is enjoyable for intermediate students. Gather your students around you and perhaps give gingerbread cookies for them to nimble on as you read the book to them. After reading, have students share with partners a family cookie or holiday tradition. 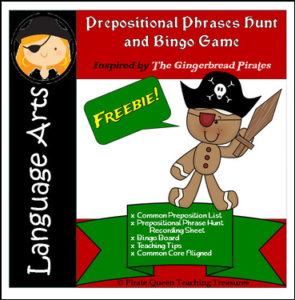 Then remind your students that pirates love to hunt for treasure, and so they will go on a treasure hunt for prepositional phrases used in the book. Once the phrases are located and listed, play the Prepositional Phrase Bingo game. Here be more Prepositional Phrases treasure!